The time has finally come for the Rosetta spacecraft’s “Philae” lander to land on Comet 67P. Rosetta’s journey began 10 years ago when the European Space Agency launched this mission. Tomorrow, November 12, 2014 will mark the day that Rosetta’s Philae lander will make history. Never has a spacecraft landed on a Comet before mostly because of the incredible difficulty of such a task. Not only does the spacecraft have to match the orbit and spin of the Comet, but scientists had to devise a way to land a spacecraft on an object with hardly any gravity. Scientists and engineers developed a plan to shoot a harpoon into the icy Comet surface in order to keep the lander attached to it. 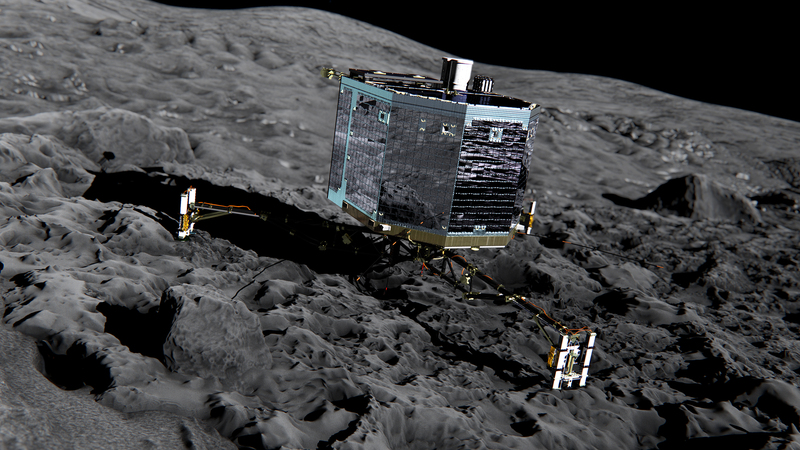 From that point forward scientists will be racing to use Philae’s instruments and take as many samples as possible. After the initial power runs out, which lasts about 65 hours, the lander will have to use its solar panels to recharge its battery. At that point Philae will have to wait a few days in between usage to be able to operate. Eager to begin using the instruments aboard Philae, Scientists believe that they will learn more about the origins of the Universe than ever before. Some Scientists even believe that life on Earth could have come from a comet. Needless to say, this is a moment that will likely change the way that we think of the Cosmos. The European Space Agency has allowed the public to follow the mission on its website. If you want to see the Philae lander make history just click here. Thanks for stopping by!